This is the first installment in a series of articles that look at South Korea’s pet culture and industry. –Ed. Stay-at-home mother Cho Young-ai has endured painful treatments to fight cancer for the past three years, but luckily two companion animals have given her a great deal of emotional support and strength to survive. “They are my family. I play with them and scold them, but at the end of the day, they make me smile and enrich my life,” said Cho, who recently adopted an abandoned dog in her neighborhood in Wonju, Gangwon Province. She said the dogs do not only serve as a source of comfort to her. They have helped unite her family, as the kids gather in the living room to play with them. 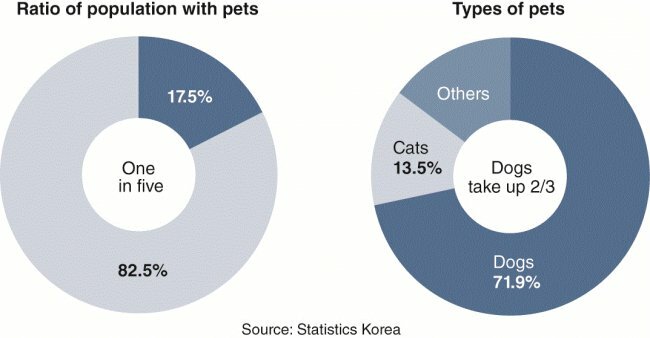 Cho is one of a growing number of avid animal lovers in Korea who recognize pets as an important part of their lives and advocate broader rights for animals. The government estimates that about 10 million people in the country raise some 4 million pets. Exact figures are not available. According to a survey on 2,096 households by the Ministry of Agriculture, Food and Rural Affairs, 21.8 percent of households were living with pets as of 2015, a 25 percent increase from 2010. Awareness of animal rights was noticeable among the surveyed households, with 92.9 percent of them supporting stricter punishment for animal abuse. Cho Hee-kyung, head of the Korean Animal Welfare Association, noted that the country has come a long way in raising public awareness of animal rights and expanding animal welfare. Several amendments made to the Animal Protection Act, which took effect in 1991, are a reminder of the maturing animal rights movement. Korea enacted the Animal Protection Act to broadly define responsibility of animal caretakers and owners to feed, house and care for their pets. It also stipulated a ban on animal abuse or inhumane slaughter. After the bill was revised in 2011, the punishment for those violating the law increased from 5 million won ($4,300) or a six-month jail term to 10 million won or a one-year prison term. In January, animals rights group Animal Arirang launched a petition on major web portal Daum to include clauses related to animal rights in the Constitution. “If rules about animal protection and welfare are added in the Constitution, it will prevent anti-animal actions such as abuse,” the group said. As of Wednesday, 1,801 individuals had signed the petition. In 2015, 12 out of 58 bills related to protecting animals passed through the National Assembly. Several bills for the expansion of the pet registration system and tougher punishments for animal abuse are pending in the parliament. Cho pointed out that one of the major achievements in Korea’s fight for animal rights was a passage of the anti-animal testing bill. The bill is to ban companies from testing cosmetics and other products on animals by 2018. “Korea began to talk about animal welfare in zoos and tougher penalties for those abusing animals,” she said. “Based on what we have achieved, society should move forward to better implement the law and institutions in reality. 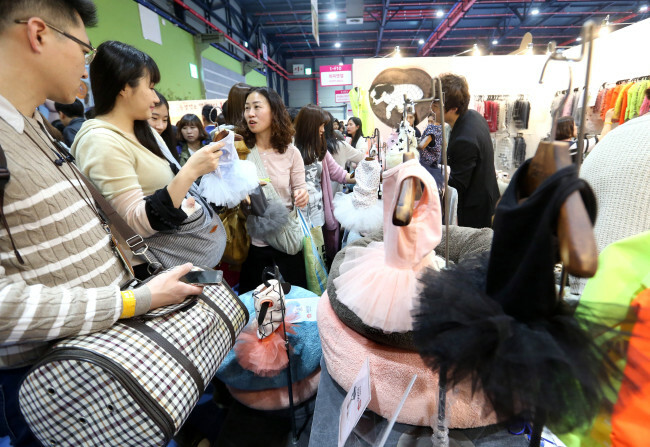 Pet lovers have spurred the pet industry, with the government estimating that the market was worth 1.8 trillion won in 2015. If it grows at the current pace, the market will be worth 5.8 billion won by 2020. These days, companies are scrambling to roll out services such as medical insurance, nursing system, funeral ceremonies and TV programs about animal welfare. A slew of events for families and their pets are also being hosted by municipalities. For instance, Gangwon Pet Festival, which will involve pets and their owners in activities such as running a race and a dancing class, will be held on Sunday. A similar event is scheduled for May 7 in Seongnam City. The government also founded a task force team encompassing relevant ministries and animal advocacy groups to lay out detailed plans and a budget to improve conditions for animals in the country. 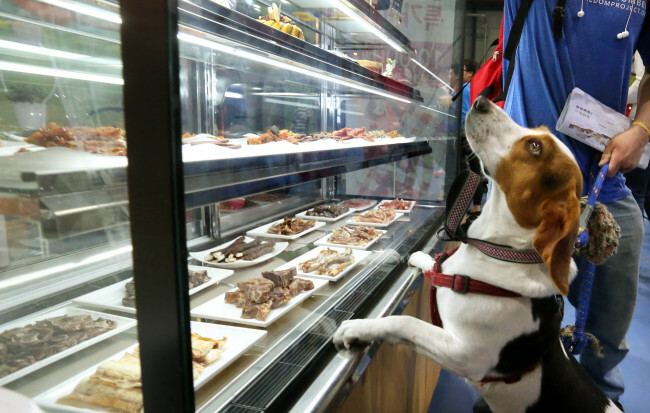 It plans to mandate training centers, animal cafes and beauty salons for dogs to register with the government before they open for business. It will also increase medical insurance coverage for animals and create more jobs to take care of animals.